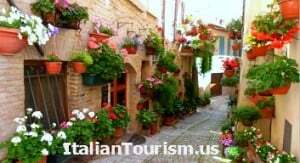 In a country full of numerous world class vacation destinations, Umbria’s towns rank among the best. It’s history is the story of western civilization. Umbria’s natural beauty is evident and earned the region the nickname “Italy’s green heart.” The culture of the people is welcoming. While you explore the Umbrian towns you’ll meet local artisans working to supply the world famous Made in Italy brands. Practicing their craft in the hill towns of Umbria, people living life locally. Here on your Italy vacation you’ll find the cultural traditions that are the ingredients of the good life. Traveling around central Italy’s hills dotted with wine vineyards outside medieval towns full of artisans workshops and delicious restaurants, you’ll be enchanted by day touring in Umbria. 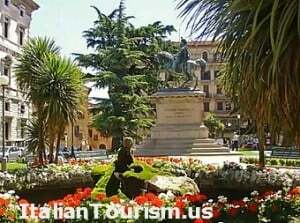 For more about Umbria sightseeing watch the video below. Umbria is bordered by Tuscany to the west, Marche to the east and Lazio to the south. Mostly hilly or mountainous, its topography is dominated by the Apennines mountains, with the highest point in the region at Monte Vettore on the border of the Marche, at 8,123 ft, and the Tiber valley basin, with the lowest point at Attigliano, 315 ft. It is one of the few landlocked Italian regions. In antiquity, the plain was covered by a pair of shallow, interlocking lakes, the Lacus Clitorius and the Lacus Umber. They were drained by the Romans over several hundred years, but an earthquake in the 4th century and the political collapse of the Roman Empire resulted in the reflooding of the basin. It was drained a second time, almost a thousand years later, during a five-hundred-year period: Benedictine monks started the process in the 13th century, and the draining was completed by an engineer from Foligno in the 18th century. In literature, one sometimes sees Umbria called il cuor verde d’Italia (the green heart of Italy). The phrase is taken from a poem by Giosuè Carducci — the subject of which is not Umbria but rather a specific place in it, the source of the Clitunno river. The region is named for the Umbri tribe, one of those who were absorbed by the expansion of the Romans. The modern region of Umbria, however, is essentially different from the Umbria of Roman times, which extended through most of what is now the northern Marche, to Ravenna, but excluded the west bank of the Tiber. Thus Perugia was in Etruria, and the area around Norcia was in the Sabine territory. After the collapse of the Roman empire, Ostrogoths and Byzantines struggled for the supremacy in the region; the Lombards founded the duchy of Spoleto, covering much of today’s Umbria. When Charlemagne conquered most of the Lombard kingdoms, some Umbrian territories were given to the Pope, who established temporal power over them. Some cities acquired a form of autonomy (the comuni); they were often at war with each other in the context of the more general conflict between the papacy and the Holy Roman Empire or between the Guelphs and the Ghibellines. In the 14th century, the signorie arose, but were subsumed into the Papal States, which ruled the region until the end of the 18th century. 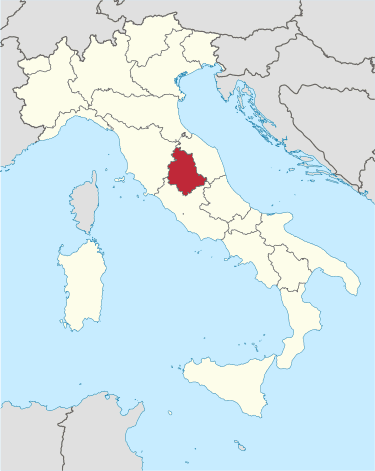 After the French Revolution and the French conquest of Italy, Umbria was part of the ephemeral Roman Republic (1798–1799) and of the Napoleonic Empire (1809–1814). After Napoleon’s defeat, the Pope regained Umbria until 1860. After the Risorgimento, the expansion of the Piedmontese, and Italian unification, in 1861 Umbria was incorporated in the Kingdom of Italy. The borders of Umbria were fixed in 1927, with the creation of the province of Terni and the separation of the province of Rieti, which was incorporated in Lazio. 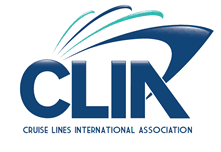 Umbria sightseeing is full of possibilities given its rich history. Umbria’s capital is Perugia. The area is frequented by people who appreciate life’s details. Fine food, organic wines, local artisans, and its rich culture all contribute to the Umbrian vacation experience. Umbria provides all the elements that make a perfect Italy vacation. Tourists to Umbria enjoy the region’s landscapes, traditions, history, artistic legacy and its influence on high culture. 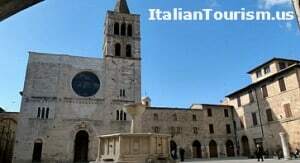 Assisi and Norcia are historical towns associated with St. Francis of Assisi, and St. Benedict. There are no large cities in Umbria. Its population is less than a million. The region is characterized by green rolling hills. 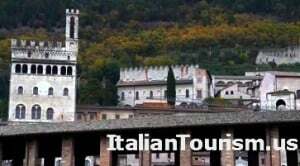 Historical towns as Assisi (a World Heritage Site associated with St. Francis of Assisi, the Basilica of San Francesco and other Franciscan Sites, Giotto and Cimabue), Norcia (the hometown of St. Benedict), Gubbio, Spoleto, Todi, Città di Castello, Orvieto, Cascata delle Marmore, Castiglione del Lago, Passignano sul Trasimeno, Cascia and other charming towns and small cities. Perugia – the capital of Umbria, a lively university town with a fascinating medieval center. 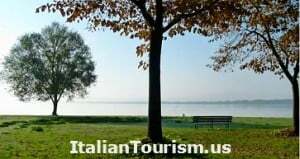 Castiglione del Lago – picturesque lakeside town with many restaurants and shops. Città di Castello – Burri Collection (modern art) and the Pinacoteca Comunale art galleries. Deruta – a center for ceramics. Gubbio – described as one of the most beautiful medieval towns in Italy. Montone – beautiful hill town, birthplace of mercenary captain Braccio Fortebraccio. Torgiano – a fascinating wine museum. Assisi – home of St. Francis and a major religious center, the Basilica has the world’s best medieval art collection frescoed on the walls. Bevagna – small but fascinating town. Città della Pieve – Red-bricked town. Home of the painter, Il Perugino. Foligno – home of Italy’s first printing press. Montefalco – Great red wine. Spello – famous for its local artists, fine food. Infiorata flower festival on Corpus Domini Sunday when the streets are covered with intricate flower designs. Spoleto – famous for its Festival of the Two Worlds. Trevi – close to the source of the Clitumnus River, a location much admired by the Romans and, among others, Byron. 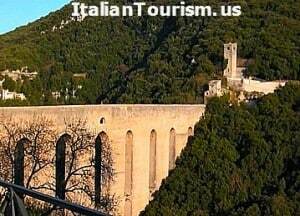 Narni – has the largest Roman bridge ever built. This town just outside Rome sits a top of volcanic rock. 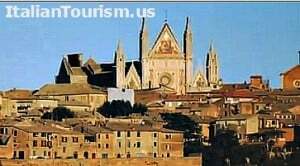 It’s most famous among sightseers for its great views of Umbria’s green hills and its Gothic Duomo that dates to the Middle Ages. Otricoli – old Roman town on the banks of the River Tiber. Terni – the main industrial town of Umbria. 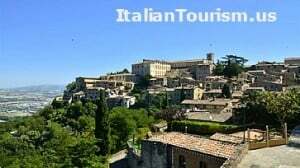 Todi – impressive hill town with much to see.